Truth time: Anti-aging skincare for men isn’t much different from anti-aging skincare for women. The same types of ingredients will improve a guy’s skin while working with his shaving routine. But men are at a bit of a disadvantage, simply because most men’s skincare products are terribly formulated, often full of drying and irritating ingredients. That’s why Paula’s Choice Skincare developed our exclusive PC4Men collection, following the same research-based approach we take when developing every one of our skincare products. PC4MEN Face Wash. Use this refreshing gel cleanser morning and night to remove dirt, excess oil, and surface grime. PC4MEN Shave provides a comfortable, close shave. Its creamy formula rinses easily, leaving skin smooth and hydrated. PC4MEN Soothe + Smooth goes on after your morning shave, and in the evening after washing your face. Its superstar ingredient is beta hydroxy acid (BHA), which gently sloughs dead skin, minimizes the appearance of redness, clears bumps and blemishes, reduces pore size, and visibly minimizes fine lines, wrinkles, and signs of sun damage. No scrub can do all of this! PC4MEN Daytime Protect SPF 30. Use this shine-free, lightweight protector every day, regardless of the weather—even if you’ll mostly be inside. Broad-spectrum sunscreen is key, because unprotected sun exposure is the primary cause of nearly every visible sign of aging. PC4MEN Nighttime Repair. This non-greasy moisturizer contains anti-aging powerhouse retinol (vitamin A), which has over 40 years of scientific research proving its effectiveness. These five products will get you well on your way to firmer, more even-toned, younger-looking skin. If you’ve already got a handle on cleansing, exfoliating, sun protection, and moisturizing, you’re ready to move up a level with one (or more) of our targeted anti-aging products for men. These are the game-changers for specific skin concerns, and can easily be worked in to your basic routine. Serums deliver a concentrated cocktail of anti-aging ingredients, and Paula’s Choice offers several formulas, based on skin type and concerns. Not sure where to start? 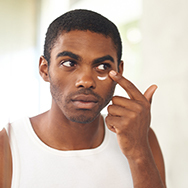 Most men will love the weightless feel of our wrinkle-fighting RESIST Ultra-Light Super Antioxidant Concentrate Serum. Apply it either during the day or at night, just before moisturizing. Paula’s Choice Skincare offers several anti-aging boosters for men—each with its own standout feature that lets you fine-tune your routine. Apply boosters after or in place of your serum, then follow with moisturizer if needed. C15 Super Booster visibly firms, brightens, and minimizes the look of red or brown areas (including post-acne marks). C25 Super Booster lets you target stubborn signs of sun damage, like freckles and brown spots, plus targets the look of crow's feet. 10% Niacinamide Booster targets large pores and discolorations. Moisture Renewal Oil Booster combats dryness, dehydration, and dull texture.Great during cold winters! Hyaluronic Acid Booster tackles fine lines and rough texture. Peptide Booster uses the building blocks of protein to tackle wrinkles, loss of firmness, and rough texture. 1% Retinol Booster evens skin tone, visibly firms, and diminishes wrinkles. Not sure how to put it all together? Reach out to our Client Services team; they’re ready to help you design the perfect routine for your specific skincare needs.